My bachelor weekend begins. J is in New Orleans hanging out with some girlfriends which means I get to eat whatever crap I want. I don’t have to worry about if there is going to be anything on the menu that she would like. A few weeks ago, I passed a couple places in the Northside neighborhood that I wanted to check out. They’re only a few blocks from each other, but I had never heard of either. I wrote down the names and Google’d them both when I got home. The only information I could find were pretty recent Gazette articles. No websites. No menus. When I’m by myself, I’ll take chances on places like this. I won’t put J through that if I don’t have to. My plan is to eat at both places this weekend while she’s out of town. The first place I decided to check out was Velt’s Soul Food. It’s on the corner of Douglas Avenue and North Street in the Northside Neighborhood. It’s an old building with only an airbrush sign on the side signifying the current business. In a previous life, the building was home to Wing Heaven. I walked in to the building around 7:30. There are only four tables in the dining room and all were taken up by people waiting for to go orders. When I walked in, I was greeted by a woman who later identified herself as one of the cooks. She asked if I needed to put in an order after she noticed me going straight for the menu that hangs from the ceiling sort of over the middle of the order counter. The menu runs the gamut of soul food classics. They have rib tips, wing dings, gizzards, catfish just to rattle off a few of the mains. The sides change constantly and are listed on a special board near the order counter. I’m a sucker for rib tips from Soul Food places and I found those right at the top of the menu. I ordered the rib tips and fries which set me back just a little over seven bucks. 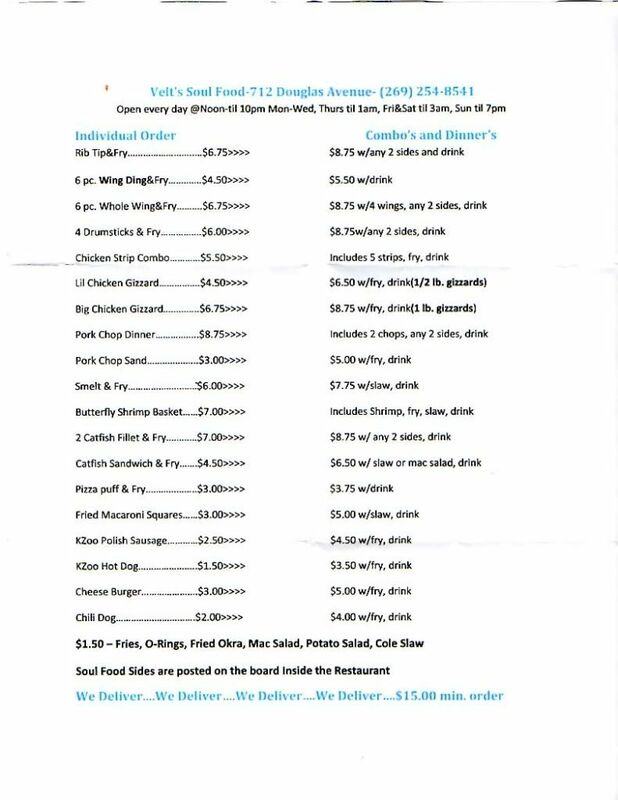 The restaurant takes credit and debit for orders over five bucks, but I had cash on me so I paid that way. The clerk was a little short of coins in the register but he went looking for the correct change. I should have just told him to keep it wasn’t that much and it was probably more of a hassle than it was worth for him. There were quite a few take out orders in front of me so the wait was a little over ten minutes. After the restaurant cleared out a bit, the woman who greeted me when I walked in came over and sat down at the table with me while I waited. She asked how I heard of the place and what else they could put on the menu. To be honest, I think there’s a lot of great looking items on the menu, including Fried Macaroni Squares, so I really didn’t know what to tell her. I told her I’m a big fan of rib tips and after seeing the pictures in the Gazette article done a few months ago, I made a point to get there to try them. A few minutes later, I was handed a Styrofoam to go box with a cup of ketchup. There are large tables in the space, but it seems like most people do carry-out. I was by myself and while I should have stayed and chatted up the cooks who were joining me at the table, I had just gotten done with a long day of work and had some stuff to do around the house so I headed home to eat. When I got home I did something I don’t normally do. I ate dinner at the kitchen table instead of in front of the television. When I opened the box, I knew they were going to be messy. 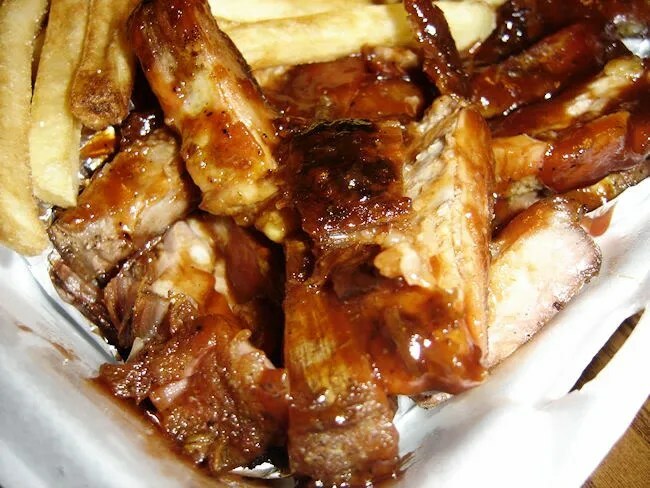 The Styrofoam container was almost overflowing with rib tips. The portion size was much larger than I was expecting. I started with the fries which also came in a much larger portion than I expected. They were typical food service fries that were seasoned pretty well. They’re a little saltier than I would normally like, but they were actually a perfect compliment to the sweet BBQ sauce that had spilled over on to the fries. After polishing off the fries, I started in on the rib tips. There were several different sizes and several different levels of tenderness. The smaller tips were much tougher than the very tender thicker pieces. All of the tips had a really good smokey bark on the top that isn’t lost in the thick Kansas City style sweet BBQ sauce. Some of the pieces were a little tough but the ones that were tender (and there were more of those than the tough ones) were so tender they fell apart before I was able to get them to my mouth. 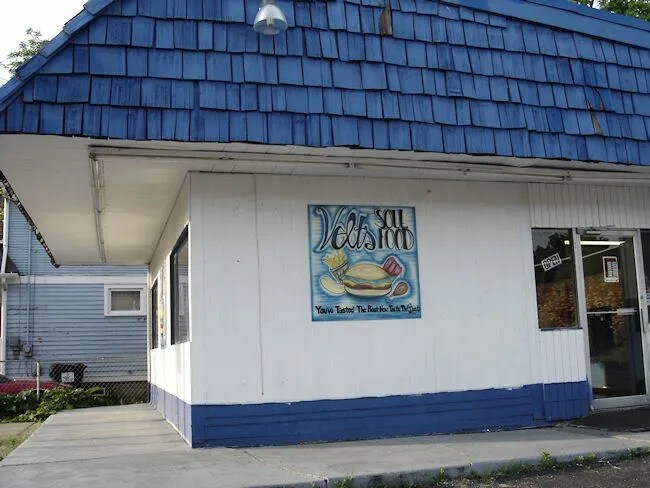 Velt’s Soul Food is one of those places I could eat every night if my waist line would let me. They always say the best restaurants have people that love food and love sharing that food with the community. 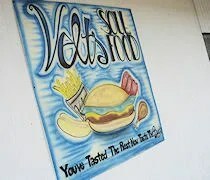 That is exactly what Velt’s is. I’m glad I finally found the time to stop in. I’m fairly certain I could eat three more meals there this weekend while J is gone and be a very happy man….. I see that there’s another new restaurant in this space, Cookie’s 5 Star Grill. I saw them working on it…but haven’t been back that way in a while. Are they open?